Experience the genuine life which is still breathing together with nature. 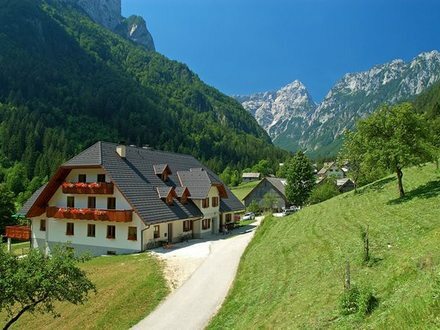 The tourist farm Govc-Vršnik is located in a beautiful and quiet part of Solčava, where guests will be enchanted by the breathtaking views over the picturesque Savinja Alps. Tourist farm Govc-Vršnik offers guests cozy rooms with lovely wooden furniture entirely made out of wood from the local forests. Guests can relax and charge up their batteries at the lovely terrace or at one of the balconies which offer breathtaking panoramic views over the great Savinja mountains. During their stay at the farm, guests can try various delicious homemade salamis (for example the famous flat salami Savinjski želodec), štruklji (rolled dumplings) with cottage cheese, žlikrofi (special raviolis) with meat or homemade pate. A sauna and a massage bathtub will make sure guests will relax their entire body and soul. Warmly welcome! Tourist farm Govc-Vršnik in Solčava.